Items were first routed to Library Photographic Services where pre-treatment 35mm slides were made of each object in order to document pre-existant condition. Typically, the image package was removed from the case well. 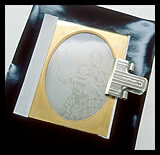 The image package usually consisted of the image plate, a brass mat, cover glass, and a brass preserver. (Figures 3, 4, 5) Sometimes an additional backing plate was present, and any of these component parts could be lacking. In almost every case, the original paper seal that sealed the plate to its cover glass was lacking, damaged, or had been replaced in the past. The cover glass was cleaned and rinsed with distilled water, but plates were not subjected to wet cleaning. Compressed air was used to remove loose dust or particles. Notes were made regarding physical details revealed; plate maker's marks, patent marks (on plates, mats, preservers, or in case wells), inscriptions (on plates or case wells). Any accompanying notes or ephemera found within cases was also noted. Unusual details, or good examples of plate marks or other information were photographed at this stage. If a dark backing sheet was present behind an ambrotype, it was generally removed, retained in a separate sleeve, and replaced with archivally processed, fiber-based blackened photographic paper. The seal was usually covered by the crimped brass preserver (Figures 10, 11 and 13, 14) but, when this preserver is lacking, the seal is often visible around the edges of the front of the cover glass. In this project, the security of this type of seal was preferred over aesthetic considerations. In many cases, a new cover glass was added where there had not been one previously, or when the original was broken. Some ambrotypes may not have been intended to have cover glass, but they were added in this project for extra protection. Occasionally, a backing glass was also added to ambrotype plates. In some instances where additional material was added, the increased bulk made it impossible to reattach the brass preserver or to replace the image package in the case well. All original component parts were retained and boxed together, but preserving the original presentation intact was sacrificed in favor of physical stability. The consultant and technician performed minor case repairs, such as re-gluing corners or adding replacement rails to case sides. (Figures 15, 16, 17) No attempt was made to re-hinge cases with detached covers, and no purely aesthetic treatments (such as re-dyeing leather) were undertaken. If a case was not strong enough to safely hold its image package, the two were kept separately and a single custom box was created to contain both. Bare plates that were found without cases or image packages were encapsulated between two pieces of glass. Usually, archival board was used to create a mat or shim to prevent cover glass from coming into direct contact with the image surface. During treatment, copy photographs were made at the discretion of the specialist consultant. 35mm color slides were shot to document daguerreian plate marks, patent blind stamps, inscriptions or printed text in case wells, and other details which can be seen only when the object is disassembled. A small selection of such documentary images has been digitized and included in the finding aid. 4x5 color transparencies or 4x5 b&w negatives were made during treatment to document exceptional images in their "bare plate" state. The decision to photograph images bare plate was based upon the quality or historical importance of the image, or upon the presence of image detail normally obscured under the mat. 4x5 images made during treatment have been digitized and included in the finding aid. After treatment, images were routed to the Library Photographic Services for photographic copying and digitization. Custom boxing and permanent housing of the cased photographs was the final step of the project. Each object and any accompanying material was measured for an archival phase box. The conservation technician added corrugated board padding and cut-outs to many box interiors to safely contain image packages and cases which were not reassembled after treatment. Each box was labeled with its identifying number and caption, plus a thumbnail printout of its digital image to permit sight identification. Since vertical storage is not suitable for cased photographs, the boxed items have been stored in flat file drawers, nested within trays that restrict shifting within the drawers. Copyright (C) 2007 The Regents of the University of California. All rights reserved.